Arch Rock has a new data center energy efficiency package that reads it all – electricity use, temperature and humidity, even fan speeds and airflow. Making data centers energy efficient is a balancing act, involving a lot of variables. Without a system that brings all those variables together, efficiency improvements are flying blind. Here's an example from Roland Acre, CEO of Arch Rock. 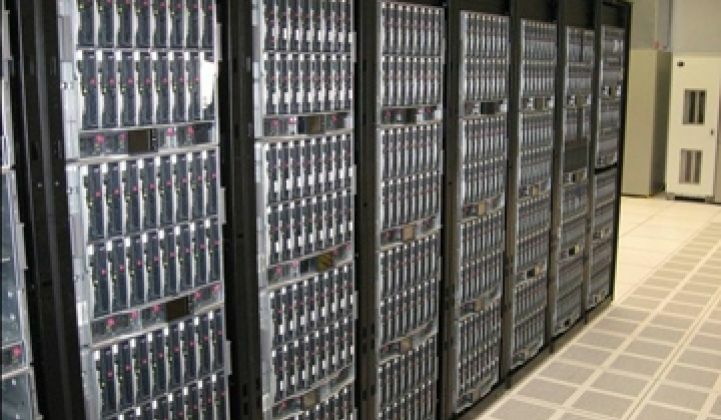 Server makers have raised the maximum temperatures their equipment can run at, giving data center operators room to play with more efficient cooling techniques, he said. But raising those temperatures might trigger a "panic reaction" from cooling fans within those servers, which will burn more juice than the power you've saved by using less cool air. To spot them, you'll need a system that combines energy and temperature sensing at an almost per-server level – and checks that data against the building's overall energy use, how that relates to what the utility's charging for power in real time, and compliance with changing data center measurements schemes and regulations. That's the capability that Arch Rock says its new Energy Optimizer system can offer data center customers, Acre said. "In technical terms, it's the organization of the environmental, thermal and mechanical aspects of the facility," as well as its electricity usage, he said. Arch Rock has added temperature, humidity, airflow and fan speed sensors to its power sensors, and tied it together with data center temperature and IT equipment provisioning mapping tools (see Arch Rock's Wireless Energy Optimizers). Data centers use about 1.5 percent of the electricity in the United States, and are expected to double that usage in the coming years. But energy prices are rising, and some data centers just can't get any more juice from their local utilities, finally making energy efficiency something they're willing to spend money on (see GE Looks to Data Center Efficiency and Sun: Data Center Efficiency for Everyone). But because energy use hasn't been a priority for data centers until recently, they're scrambling to beef up what patchwork power and temperature sensors they do have with wireless systems that can offer more detailed information. Arch Rock, which has raised $15 million in two rounds of venture capital funding from investors including NEA Vetures, Intel Capital and Shasta Ventures, is just one of the startups moving into the space. Acre noted, for example, that Arch Rock's addition of thermal and humidity sensors could improve its competitive stance against Folsom, Calif.-based startup Synapsense, which has raised about $20 million and specializes in such environmental sensor systems (see Bosch Joins Investors in SynapSense). Others data center efficiency startups include Redwood City, Calif.-based Sentilla and Santa Clara, Calif.-based Power Assure (see Sentilla Raises $7.5M to Compete in Data Center Power Fray). One big question is how all this new data will be managed. All of the startups mentioned make software to integrate all this environmental information into building systems management systems. But the giants like Hewlett Packard, IBM, BMC and CA that dominate the data center IT management console business today are probably working to meet the same needs from their customers, analysts note (see The Race for the Data Center's Brain). CA, for one, officially launched its EcoSoftware product on Monday, noting that one of its customers, Datotel, is using it for data center energy efficiency and carbon accounting purposes (see CA's EcoSoftware Lands Tesco as First Client). Arch Rock has worked to integrate its control panel into a data center system from at least one of those giants, Acre noted. All told, about a dozen clients have ordered the system so far, which starts at $10,000 for a smaller system and moves up quickly as needs grow to hundreds of sensing points, he said.